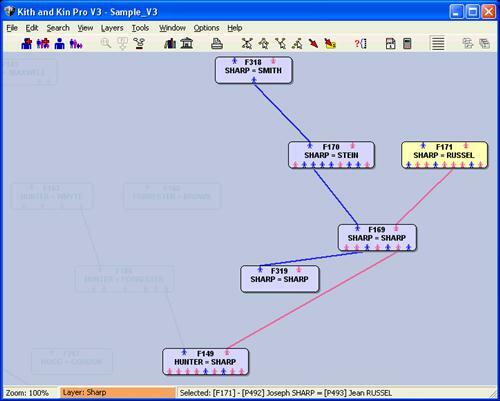 Kith and Kin Pro is a genealogy software package for storing, querying and documenting family trees. It features a unique, easy to use graphical interface and powerful data management tools which makes it ideal for large or small trees. - Unique family tree display on screen lets you easily navigate your data. - Source document recording. Each field in a person or family data form has a button which lets you record a source reference for that field. The reference points to a page in a source document and the document points to a repository where the document is kept. - Export reports to Adobe PDF files which can be read by anyone with the free Adobe Acrobat reader. - Web page production. Completely automatic; all you have to do is upload the files to your Web site. - Simple searches. Type the text into the field you want to search for and click "Search". - Search for similar sounding surnames using Metaphone and Soundex. - SQL queries (Structured Query Language) for complex searching and producing custom list reports and text files. - Unlimited user-defined fields in both people and families. You can choose the field type; string, date, etc. - Almost unlimited storage. 2,100 million of any one record type in any tree. - Full GEDCOM V5.5 implementation. Registered with the LDS for Ancestral File and TempleReady submissions. - Multiple pictures can be associated with people, families and sources. Pictures can be included in Details reports and Web pages. - OLE objects can be associated with people or families. This allows you to store multi-media items such as video or sounds. - Duplicate record searching/removal assistance. If you regularly import or merge data with your existing trees, Kith and Kin Pro will help you identify, merge and remove duplicated records. - Multiple notes for each person/family. Each note allows 30,000 characters and you can have as many notes as you want. Give each note a description to help you find it and a privacy level to let you control when it gets printed or exported. - Data form edit fields pick lists. Right-click on, say, a "Place" field in a person or family data form and a list of the places which you have already used pops up. You just pick the one you want to get it entered into the field with no typing. - Easily interfaces to TreeDraw, our best-selling add-on charting software. OS : Windows 98, Me, 2k, NT4, XP, Vista, Win7, Win8, Win10 (32bit and 64bit). Spansoft Kith and Kin Pro 3.2.5 download links are externally hosted on Extabit, Rapidshare, Rapidgator, Netload, Uploaded and Spansoft Kith and Kin Pro 3.2.5 also available directly on Torrent Sources.